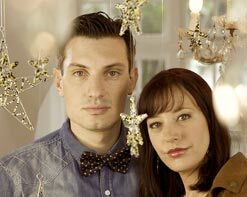 Cheryl and Martin Engel officially formed Connecting Stars in 2012, but have been singing and playing on stage and in the studio for over ten years before that. Cheryl’s extensive experience as a studio session singer has helped hone her true calling, where Martin’s managerial and bass playing experience has gained him a strong workflow; he is also the owner of Dog Ears Studios and Sesalos Media, a leading South African recording studio and video production company! Both Martin and Cheryl’s years of musical experience and intuitive interaction make for unforgettable live performances. Acoustic guitar, piano, and hauntingly beautiful melodies and harmonies form the backbone of Connecting Stars. Intertwined with unique instruments such as glockenspiel, ukulele, harmonica, and mandolin, Cheryl poetically crafts lyrics that have come to be a breath of fresh air. Their self-titled release blends heartfelt lyrics with memorable melodies, taking the listener through soft highs and crushing lows of love found, loss or betrayal, and even confusion and helplessness. The fun-induced single “Stuck” puts a modern twist on this folk inspired tune. The video clip is a microscopic look at the power of people—set in the airy outdoors, Connecting Stars bring multitudes of people together one by one with their song of innocence. Showing the world what they’ve got, Cheryl strums her guitar as she sings the melodies of her heart. As passerby can’t help but become enthralled, “Stuck” takes on its own persona as the song that brings the world together. For more information on Connecting Stars, please contact Andy Gesner and the HIP Video Promo staff at (732)-613-1779 or email us at info@HIPVideoPromo.com . You can also visit www.ConnectingStars.co.za/ for more info.